Today we’re going to talk about the single-most important flavor factor for a lot of different dishes: mirepoix. (Pronounced meer-PWAH.) 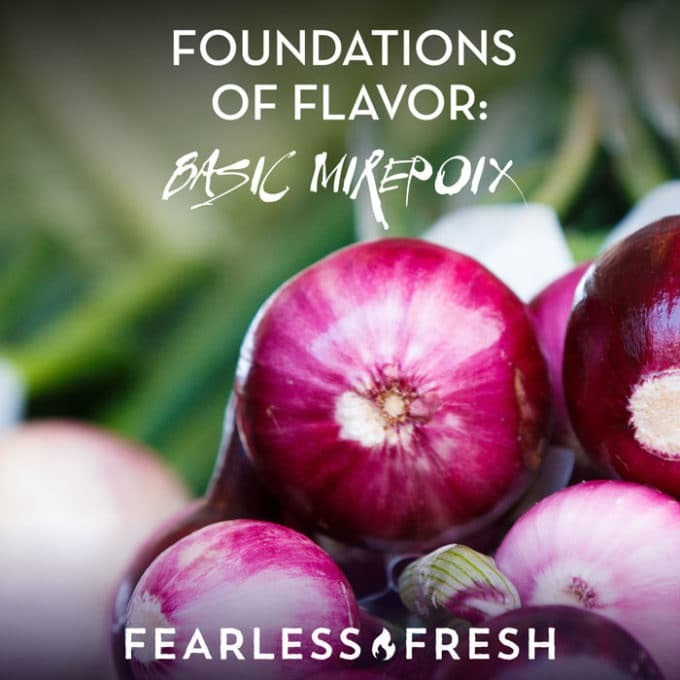 Yes, this is a very fancy-pants sounding word*, 😂 but what really matters is that knowing how to make a mirepoix recipe can SERIOUSLY up your game while cooking. A mirepoix is a simple mixture of chopped onions, celery, and carrots that you cook gently on the stove until the vegetables develop complex flavors, usually until they are browned. You then use these cooked vegetables as the base for the rest of your dish (such as stocks, soups, and sauces). You don’t really need a mirepoix recipe once you’ve made it a couple of times, but it’s handy to have a recipe the first time so you can get the hang of how to make one. 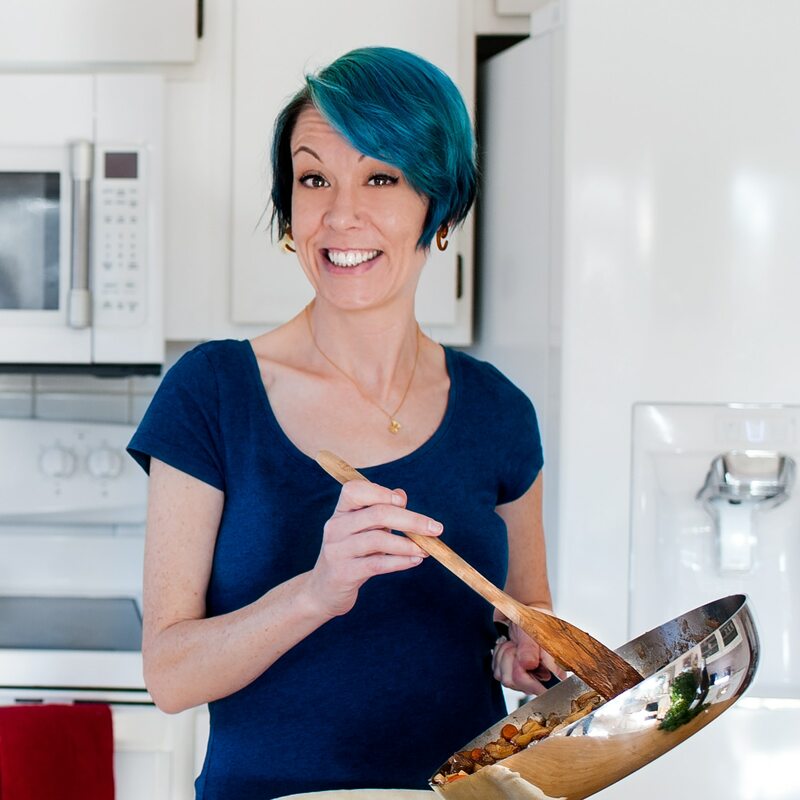 There’s a catch to this catch, though… and it’s this: if you’re making a white soup where the white color is really important (like clam chowder) then browning your vegetables will turn your soup beige. So if you’re making a white soup and you want it to stay looking bright white, don’t brown your vegetables. So if you’re making one cup of mirepoix, 1/2 cup is onion, 1/4 cup is carrots, and the remaining 1/4 cup is celery. These vegetables should be chopped to relatively small bits, anywhere from 1/2- to 1-inch pieces. Ideally all of the chopped vegetables bits are about the same size so they cook at the same rate and look nice when they’re done. This mirepoix recipe is a simple mixture of chopped onions, celery, and carrots that you cook gently on the stove until the vegetables develop complex flavors, usually until they are browned. You then use these cooked vegetables as the base for the rest of your dish (such as stocks, soups, and sauces). Using a sharp 8-inch kitchen knife, cut each vegetable into 1/2-inch cubes. Here’s a video on how to chop an onion so that all the pieces are the same size. Pour the oil into your pan and set it over medium heat. As soon as the oil begins to shimmer, add the vegetables to the pan and stir well. Do not let the oil smoke! If it starts to smoke, throw out the oil, wash the pan, and start over. Burnt cooking oil tastes really bad. Continue to cook the vegetables, stirring every few minutes, until they are well browned (but don’t let them burn). Don’t be afraid to let the vegetables sit and brown before stirring. This is the process of caramelization that creates so much flavor. Part of learning to cook is knowing where the line is between browning and burning, and mirepoix is a PERFECT simple dish to learn this lesson. Once the vegetables are well-browned and fragrant -- stick your face into the steam and you’ll notice they’ll smell very sweet and a little nutty -- they’re done. This is where you add them to whatever dish that calls for them. Sometimes a mirepoix can be chopped into large pieces, such as for making stock, and other times it’s chopped into small pieces. It all depends on the dish and how long it cooks. General rule: the longer it cooks, the larger the pieces can be. You may find some mirepoix recipes where the mirepoix is not cooked beforehand at all, though I usually brown them anyways, because that’s the whole purpose! If you’re making an all-white dish, like a white sauce, you might want to make a white mirepoix. In this case, you would just gently cook the vegetables until they’re soft, but not brown, so they do not turn your finished dish brown. When you make a white mirepoix, sometimes you’ll be told to leave out the carrots. Instead of carrots, you can use chopped parsnips and white mushrooms to add more flavor. Mirepoix is basically the concept of using cooked vegetables as a flavor base for a larger dish. There are different kinds of flavor bases used in different cultures, and every country calls it something different. The mirepoix I’ve outlined above is used in most French cooking, and by proxy a lot of western cooking as well.